In the past, mold maker was permitted to take long term for complex mold making. But, today, user requests to mold makers are changed "Short delivery, low cost and high quality". We silver alloy have been a steady decrease in cost of mold making year by year, a lot of our customers. We apply the technique to special configuration molds. 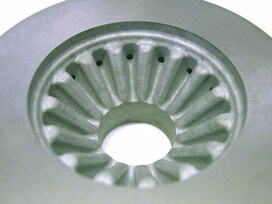 This time we produce preforms of bevelgear mold to reduce the total cost at our customers. With general preforms, long process and long process time was needed to finish and a lot of high risks of mistake. If you use a blank look like fig.1, you can understand risks and long process time, rough EDM, finishing EDM, air hole with relief. With our new blank, you can reduce the total cost, EDM time, electrode, micro EDM for air hole. You will get blanks, it is already rough processed, rough cutted and air hole with relief. rough cutted blnaks help you to reduce final cost. Rough EDM process time are saved drastically and less necessary electrode(Fig.2). And also reduce the risk of making.